The user of the Logia “Rumble-Rumble Fruit”, giving him control over lightning. He ruled Skypiea as a tyrant for six years until his worst nightmare, the rubber-man Luffy, appeared. 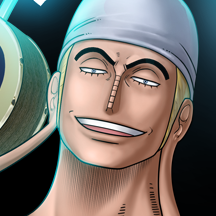 After being defeated by him, Eneru set out for the moon in his Ark Maxim. FUNimation® Productions, Ltd. All Rights Reserved.